ASHLAND CITY, Tenn. (Nov. 5, 2018) – A. O. Smith, the leading manufacturer of hot water systems for homes and businesses, has partnered with ENERGY STAR® to launch a new Contractor Locator Tool that will connect A. O. Smith installers with consumers interested in energy efficient heat pump water heaters. A. O. Smith contractors. The tool connects in-market consumers with contractors in their area who are active in the Contractor Rewards program by driving homeowners from www.energystar.gov directly to loyal A. O. Smith contractors. 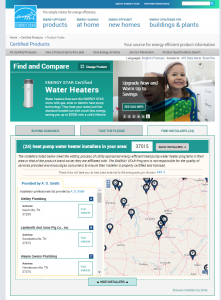 Consumers who visit the ENERGY STAR website looking to upgrade or replace their water heater with heat pump technology will be connected to more than 1,000 contractors skilled in installing ENERGY STAR® certified water heaters through the “Find Installers” function. Contractors installing heat pump water heaters who want to qualify for listing must first enroll in the Contractor Rewards™ program and enter the code from the yellow Contractor Rewards label found on each unit. ENERGY STAR® is the government-backed symbol for energy efficient, providing simple, credible, and unbiased information that consumers and businesses rely on to make well-informed decision. Partnered with the U.S. Environmental Protection Agency (EPA), ENERGY STAR® certified products deliver the quality, performance, and savings consumers have come to expect.